It is very well understood that Business Enterprises today need to become more agile, meet new and increasing workload and security requirements, while reducing overall IT cost and risk. To meet these requirements and remain competitive many companies are turning to cloud computing. Companies thus need to formulate a strategy that can easily move them from traditional on-premises IT to private or public clouds. Oracle understand the need for IT organizations to move to cloud computing at the same time also recognizes that moving to the cloud is a multi-step journey that starts with standardization and consolidation of IT infrastructure and ends by moving applications and data to the cloud. 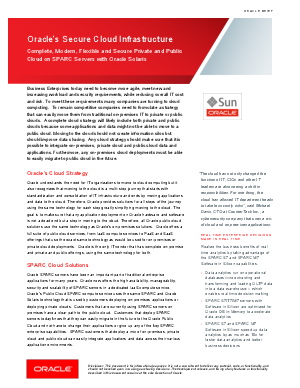 The PDF is meant to help you gauge through the Oracle’s SPARC servers and give you an experience of simplified journey to the cloud by using the same technology for both cloud and on-premises deployments. No matter where your IT organization is on the journey to the cloud SPARC servers will be an ideal solution.